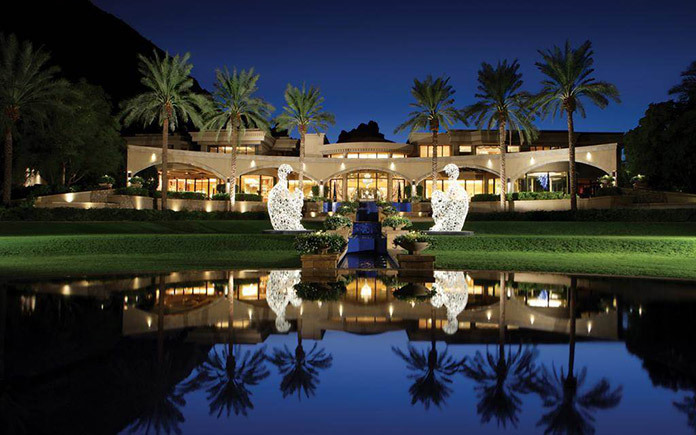 With its enchanting desert location, masterful design, sweeping views of the valley and sensational resort amenities, Villa Paradiso presents a rare opportunity to own a privately-gated oasis in the American Southwest’s coveted Paradise Valley. This remarkable estate boasts more than 36,000-square-feet of luxurious and resort-quality living and entertaining space, while still embracing the comfort and warmth of home. The property is represented by exclusive Affiliate Walt Danley Realty, with global marketing by Christie’s International Real Estate. The magnificence of Villa Paradiso is apparent upon entry. 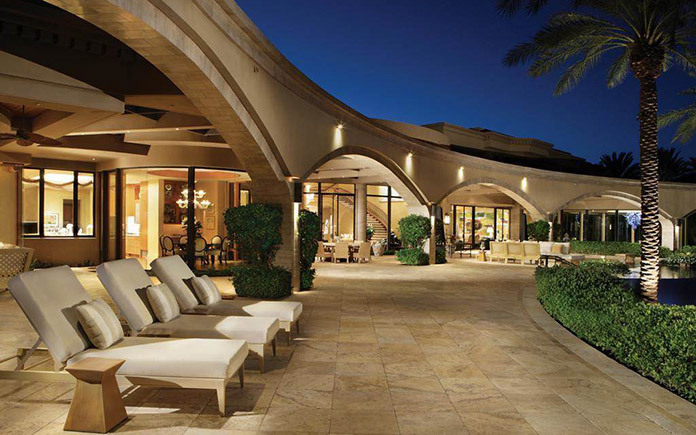 Bordered by stately palms and lush desert flora, the driveway leads to the centerpiece of the estate—a remarkable 30,858-square-foot main house. 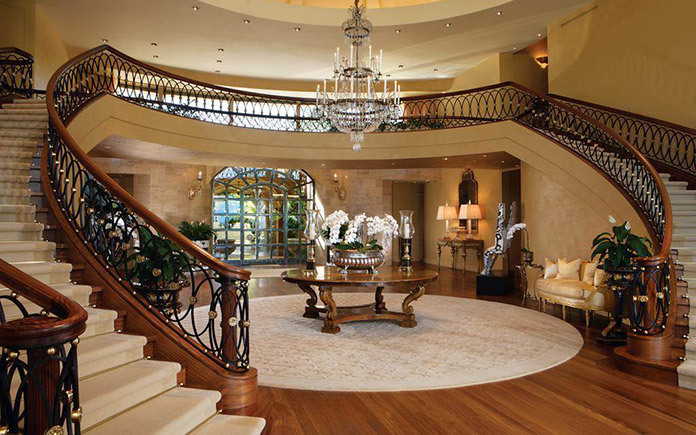 The home’s entry welcomes with a grand rotunda graced with a coffered dome ceiling and sweeping twin staircases. 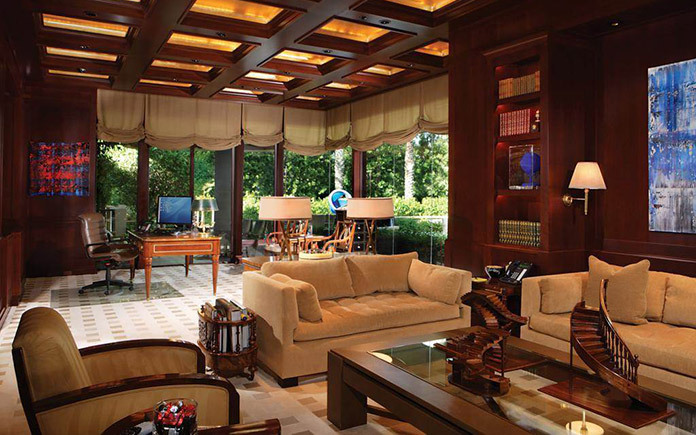 Beckoning beyond are the home’s living areas, an exquisite combination of fine finishes and furnishings, the masterful creation of renowned interior designer David Scott. The home’s unique and thoughtful appointments include a tranquil water room—a circular and glass-enclosed island off the formal living room—completely surrounded by water and in sharp relief to the arid beauty of the American Southwest desert outside. 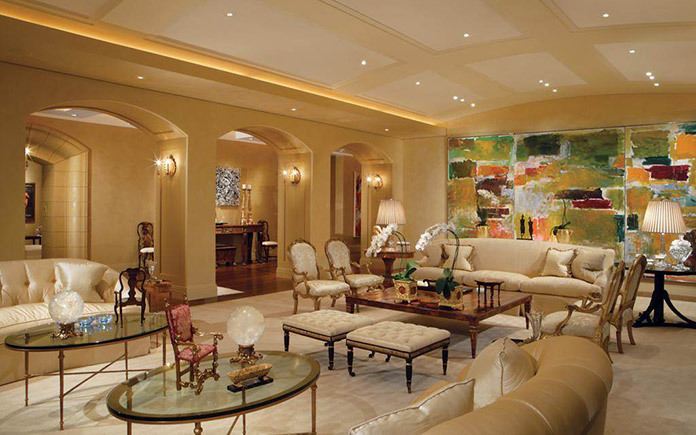 The art gallery, running the length of the home, features a museum-quality hanging system and underscores one of the home’s original concepts as a showcase to display fine art. The owners have been avid collectors for more than 20 years and this state-of-the-art wire suspension system allows them to display and rearrange their collections without repairing holes in the gallery’s wall. 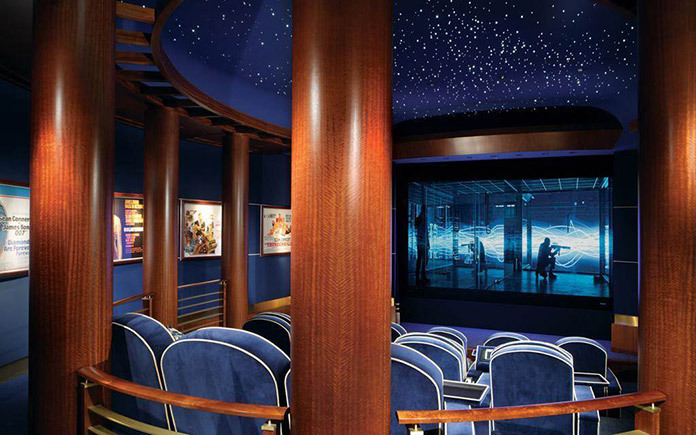 The superb home theater and lobby, a work of art in its own right, was conceived by the legendary cinematic designer, Theo Kalomirakis. An indoor basketball court with an electronic scoreboard and private skybox, gym, home office, an attached guest suite, staff quarters, and two elevators further complement the residence. The family’s private quarters are housed on the second floor. A stairway bridge with an amazing view of Four Peaks connects the sumptuous master wing and the children’s wing. In the master area, a sitting room, secondary office, spa bathroom, hair salon, kitchenette, and multiple outdoor view terraces provide a spa-inspired experience unlike any other. 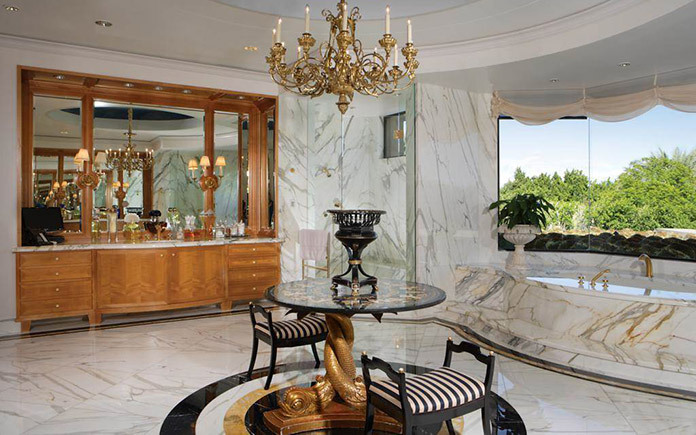 The his-and-her dressing areas and closets are by Linda London, internationally renowned for designing similar spaces for the world’s most exclusive clientele. 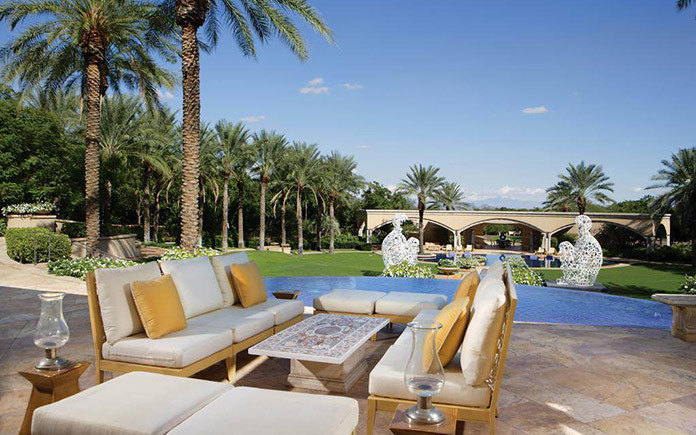 Villa Paradiso’s grounds are a private sanctuary replete with seven soothing water features, patios, a pool and pool house, and classically inspired gardens, which create the perfect setting for outdoor entertaining or relaxing to the sights and sounds of the desert. The 3,636-square-foot guest house reflects all the fine features of the main residence and includes its own negative edge-pool, three bedrooms, full kitchen, living room and laundry area. Unrivaled sophistication and attention to detail define this grand estate with its commanding views of Camelback Mountain, the McDowell Mountains, and Four Peaks. With a total of eight bedrooms, 11 full bathrooms and nine powder rooms, Lite Touch smart home system, 12 garage spaces and five carports, and state-of-the-art appliances and features, this home redefines modern luxury while welcoming extended family or guests. 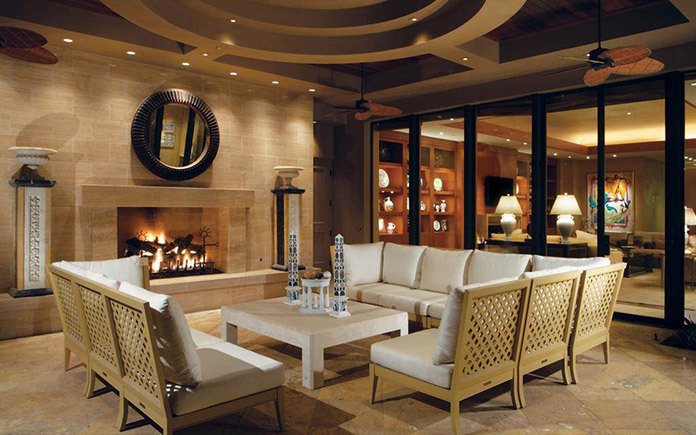 A recreation and nature lover’s paradise, this secluded enclave in the foothills of Camelback Mountain is aptly named. Paradise Valley offers world-class recreation, including numerous country clubs a short drive away, miles of hiking trails, other outdoor pursuits, and all only five minutes from the cultural and dining attractions Scottsdale has to offer and 20 minutes from Sky Harbor International Airport.